Erica Oberholtzer is returning for her 6th year at Blast. Oberholtzer completed her first season as the Head Girls Lacrosse Coach at West Chester East High School. Oberholtzer previously coached at Bayard Rustin High School in 2015 and 2016, bringing the team up from a 3-15 record to 10-8 in 1 year and earning district playoff seeds each year. In 2017, Oberholtzer was an assistant coach at Kennett High School. Oberholtzer has also served as an assistant soccer coach in the West Chester Area School District and Kennett Consolidated School District from 2014-Present. Oberholtzer served as head women’s lacrosse coach at Centenary College in 2014. During her first season in Hackettstown, Oberholtzer led Centenary to its fifth consecutive appearance in the CSAC Tournament after placing sixth in the regular-season standings. Oberholtzer took over the Cyclone women’s lacrosse program after working as an assistant coach at Eastern University where she completed her master’s degree in education and earned a health and physical education certificate in spring of 2013. Oberholtzer has also earned a master’s degree in special education at Eastern University in the summer of 2017. In addition to her coaching experience at Eastern, Oberholtzer spent three years as an assistant lacrosse coach at Archbishop Carroll High School where she guided the team to the quarterfinal round of the Pennsylvania state playoffs each season. Oberholtzer is a graduate of Villanova University where she was a walk-on for the Wildcats’ women’s lacrosse team. She earned her bachelor’s degrees in English and education in 2009. 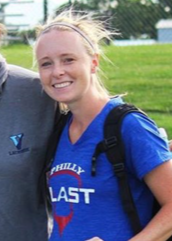 During that time, Oberhotlzer also coached middle school soccer, basketball, and lacrosse and became the head coach of the U-15 Philadelphia Area Girls Lacrosse (PAGLA) summer team. During her sophomore year at Villanova, Oberholtzer co-founded the Marple Newtown Girl’s Lacrosse League.